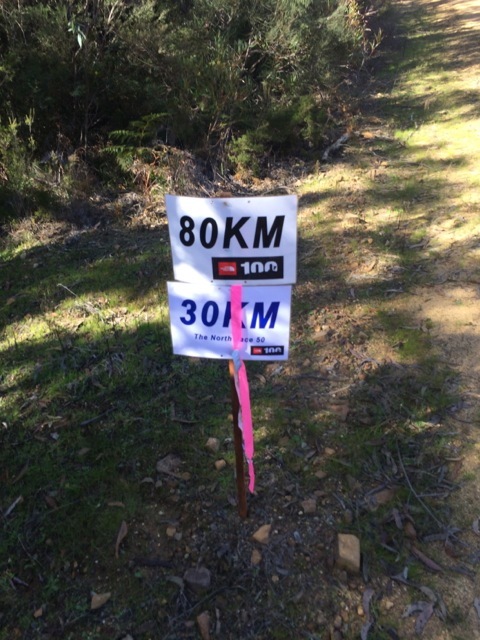 My lead up to the TNF50 was very, very ordinary. I had taken 3 months off after the Spiny Cray Ultra at the end of September 2013 to try and get rid of achilles tendonopathy. After 3 months of physio and swimming training, we finally discovered that my post tibialis muscle is very weak and is causing pain in the achilles. And then my back decided that it was its turn to be sore and painful. So another 3 months of physio – I don’t heal like I used too ….. So I finally start training for the TNF50 in March 2014. Only 3-4 k per run, plus a strength session each week. And then I lost my running mojo. Somehow in April I re discovered my running mojo after a great run with friends around Lane Cove. And that is when my TNF 50 training started. A month out. 2 weeks out, I came down with a really nasty cold virus after a rather large night out on the piss for my birthday ….. 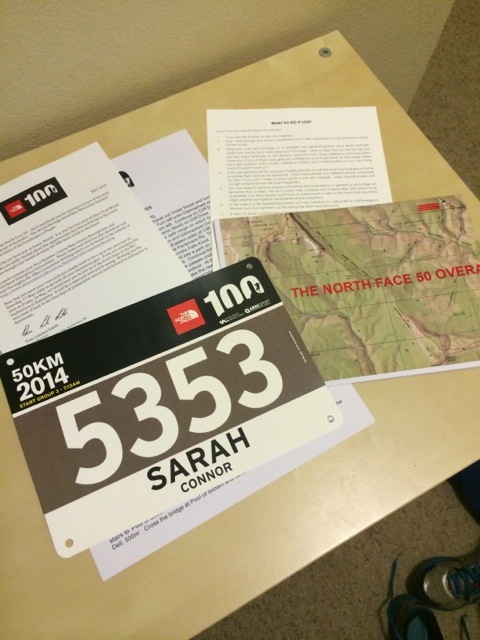 I signed up for an adventure race with a girlfriend the week before the TNF50. Why? Cos it was fun!! 8k of paddling orienteering and a 3k orienteering course. My back was great and the running was pretty good too. So the week before the TNF – physio was happy with my back, achilles was behaving, my number arrived, the nerves started, I found all my gear, bought a new Nathan Vapour Wrap pack. Sorted out my gear and wondered whether I should go and get a lighter rain jacket as I needed a bit of space, when lo and behold, I was lent a prototype Salomon Sense Flyweight jacket which was vacuumed packed and weighed about a ¼ of my Patagonia Torrentshell . Thanks Ben! Pre race nerves meant for a crap sleep the night before – but I did manage at least 5 hours worth and that’s pretty good for me. 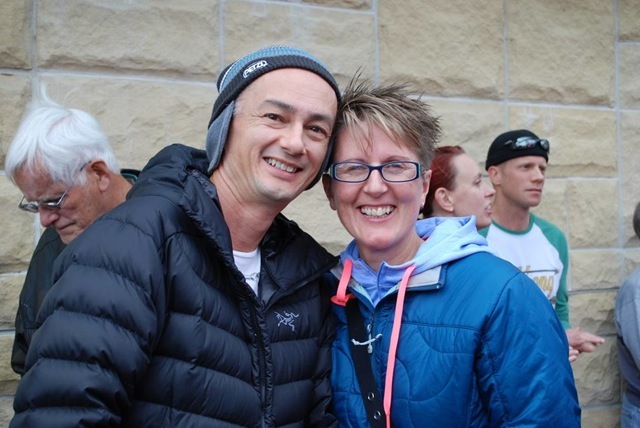 Got dressed, had breakfast (tea and toast) and set off to the start with Sarah (yes a different Sarah, she only has one personality called Sarah that I know of- Ed) about 30 mins earlier than planned…. Met up with the Summit Sisters and had some photos taken and jiggled up and down to keep warm. On the start line, I did wonder whether I had bitten off more than I could chew… ah well too late now. Tom counted us down to the start and we were off. First 6k was good, walked the hills and took it easy on the bitumen. I managed to get to the bottom of the Giant Staircase without freaking out too much – thanks to the guy in front of me who talked the whole way down about random stuff and kept my mind from the fact we were going down a cliff face. The first big set of stairs did my quads and glutes in. Luckily I knew this bit quite well and was happy to have all the technical stuff at the start of the race when my legs were fresh. At Olympian Rock, Gavin and Rebekah Markey were there cheering people on and it was great to see them and get some much needed encouragement. 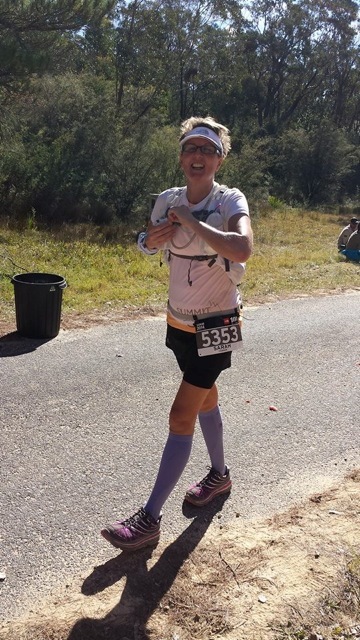 Bek and Janis were at the 13k water point – I did not stop, but it was great to hear my name being called out! At some point after the water point, I was the head of a very long conga line. I kept saying to the guy behind, tell me if you want to pass. He was happy for me to be in the lead. He asked what time I was aiming for and said 10 hours or less, he then replied that he was on course for an 8 hour finish at the pace we were currently doing. Whoops. Just a bit too fast. Sarah Jane Marshall caught me just past the Conservation Hut and it was lovely to hear her voice! I tried to stay with her, but she was too fast , motoring along to finish in under 8 hours . Along Tableland Road had a chat to Brad who threw people out of helicopters for a living. His nickname was Nudge. And that was really the last person I ran with until the Furber Stairs. Checkpoint went smoothly – had a chat to Jill, Bek and Janis – thanks for letting me hug you both sweaty and all. Ate some noodles, banana, filled my bladder, filled up with Clif bars and used the facilities. Tried to stretch as both ITB’s were very sore and I knew the 9-10k downhill was going to be tough. And then the suffering began. Walked out of the checkpoint and discovered my legs were not very happy about running, so I power walked down Kedumba. I was passed by many many people – that was very discouraging. Nudge tore past down the hill – he was plugged into some tunes and looked much better than he had before CP1. 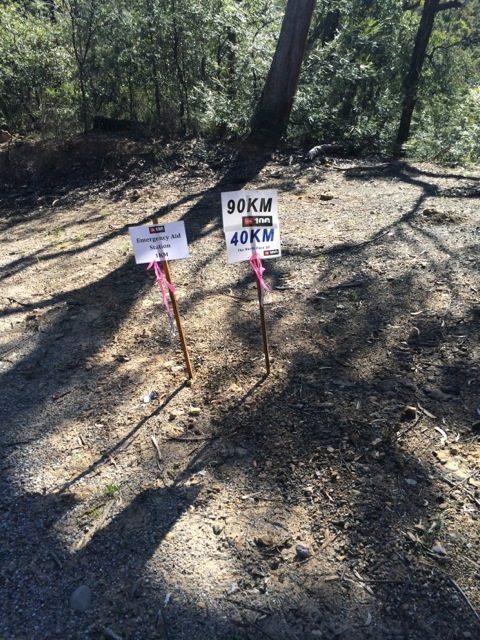 I tried to keep positive, took photos of the km markers, looked at the trees, said hi to people as they streamed past. Richo and Jess caught me about halfway down Kedumba. . I tried to stay with them, but my quads just did not want to know about running downhill. Finally made it to the bottom – relief. And then the uphill. And a bit more slow downhill. Uphill was good – I managed to keep up a consistent pace. But boy I was in pain on the downhill bits into Leura Creek. I did catch a few people (ok 2) but as soon as the downhill bits came, it was soon reversed. It was at this point I really wished I had someone to talk too just to stop my brain from feeling the pain. Made it to the 41k first aid point, filled up the bladder just in case and kept walking. I then noticed my fingers where very swollen – and my feet were not feeling much better. And I started to fantasise about finishing. Stomped up the hill, through the Leura Forest, tried to smile for the camera. Failed. Saw a Lyre bird and a King parrot – that was lovely and took my mind off the pain…. 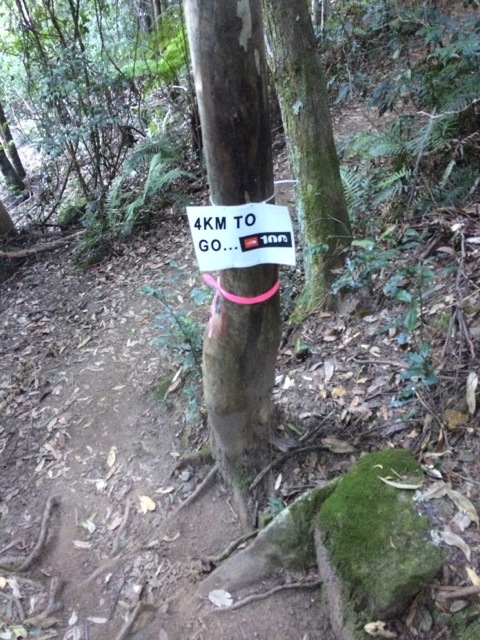 Then I saw the 4k to go marker. Oh boy. Did that make a difference. I stomped a bit faster. Still being passed by other runners but at least I was moving a bit faster. An English girl caught me just before the Furber Stairs, and she was really positive and made me feel much better! Thank you to whoever you were! We caught up to Emma, and she told us that it was her birthday. So true to form I sung (very badly of course) whilst going up the stairs. Great distraction. At the top, a lovely man told us that we only had 150m to go. Of course I did not believe him. And he was right! Managed to sprint up the finish chute and make a spectacle of myself. Richo gave me a big hug in the finish area which was much appreciated, English girl handed me a water and then the men’s winner and second place getter of the 100k finished – birds eye view or what! Emma and I shared a hug for beating them across the finish line as we knew it was going to be close. And then I looked at the time. And almost died. Under 9 hours. My brain was so frazzled I could not do the maths to work out what my time really was as I started in Wave 3. I just knew it was under 9 hours ! Turns out I was 8:47. Only 6 minutes slower than last year . No real training and 6 minutes slower. This course suited me much better than last years. North Face 100 visor (nicked from Adam). Tailwind for first 28k and Hydralyte sport for next 22 k.
(Picked up 2 extra Clif bars at CP1, ate some pot noodles and banana). Came back with 2.5 clif bars. Unfortunately my body did not want Clif bars especially towards the end, but I forced myself to eat them. Cheesymite was an experiment – I think I will make my own without cheese as there were a couple of times where my stomach was not happy. But a couple of big burps sorted me out. Need to mix the electrolyte powders better in the bladder as it was very strong for the first few sips! Would not wear the North Face visor again as it reflected the sun into my eyes and I had a headache by CP1. (Its white underneath the visor). I chose not to wear my Garmin and I think it was a good choice. My phone was in easy reach to check the time for nutrition – which I did once. And then I just kept nibbling every 15 mins or so. 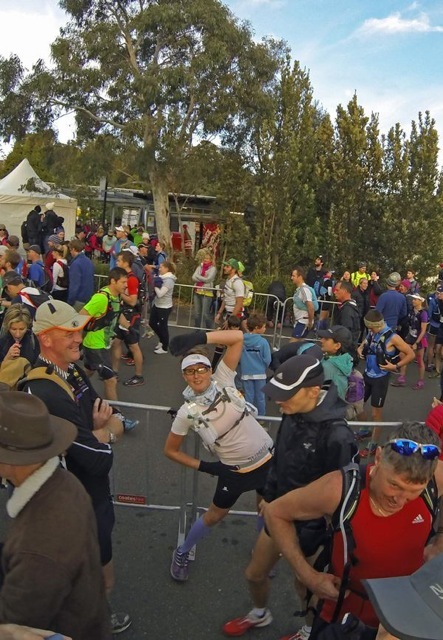 The Nathan pack was good, but I need to sit down and work out where things go – I broke the rule about not doing /using anything new on race day. How could I forget to thank the volunteers who gave up their time, to watch us crazy people run! And to AROC for such a wonderful event – thanks Tom and Alina! Jo and Gretel from the Summit Sisters for looking after all of us pre and post event , all my friends who supported us through the day and some new ones met along the way ! This event is very special and made more so by the people who organise, crew, support, run, volunteer, sweep and photograph . THANKS !! 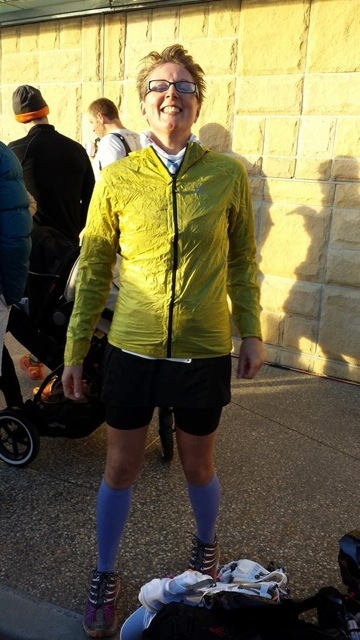 This entry was posted in Guest Post, Race Results, Race/ Run Reports by Adam Connor. Bookmark the permalink. Hi Sarah. Well done!! Great report of your 50km trek. I felt your pain, not that I will ever run 50km in one hit. Thanks Heather – its an event well worth going too. Either racing or watching !